S (Scripture): Luke 24:30 When [Jesus] had taken his place at the table with them, he took the bread, blessed and broke it, and gave it to them. 31 At this point their eyes were opened and they recognized him. Then he vanished out of their sight. 32 They said to each other, “Didn’t our hearts burn within us while he was speaking with us on the road, while he was explaining the scriptures to us?” 33 So they got up that very hour and returned to Jerusalem. They found the eleven and those with them gathered together 34 and saying, “The Lord has really risen, and has appeared to Simon!” 35 Then they told what had happened on the road, and how they recognized him when he broke the bread. O (Observation): This is the tail end of the Road to Emmaus story. The resurrected Jesus ends up walking with these two men, who are extremely disappointed that Jesus has been crucified. Their hopes are dashed. And for the final reveal, Jesus breaks bread. In the breaking of the bread, they finally see Jesus for who he is – the Messiah! – in their very presence. A (Application): As a Lutheran, this story resonates deeply with me. We believe that Christ is in, with, and under the bread and wine at Holy Communion. We believe that we are close to God in those holy moments. Jesus is revealed to us – this day – in the breaking of the bread. I have begun a study of Martin Luther’s Large Catechism in our adult Sunday School class. We will discern God’s essence through the Commandments, Creed, the Lord’s Prayer, and the sacraments. In the sacraments, we believe we have a tangible representation of “God with us.” We believe that Jesus set this meal apart to cleanse us, make us whole, and remind us that Christ is with us on the way. Do you ave any stories of Christ being revealed to you “on the road”? P (Prayer): Lord, reveal yourself to us, that we might be reminded that you are right beside us on this journey called “life.” Amen. 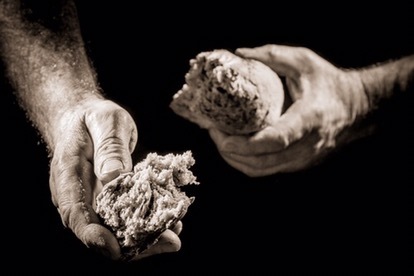 This entry was posted in Digging Daily and tagged Bread, Communion, Messiah, Raised. Bookmark the permalink. Ideas (thoughts) are the building blocks of Reality.